In the Fortress of Solitude, Kelex struggles to keep Superman alive. Nearby, Cir-El worries for her father, distraught. Kelex warns her that if she had something to do with this, she'll be in big trouble with the Fortress' defenses. Kelex also tells her that she's not Linda Danvers, so she's no Supergirl. Supergirl hits him with a red sun burst, throwing Superman, now sitting up, and Kelex, across the Fortress. She apologizes, and Kelex carries Superman to a scanning table. 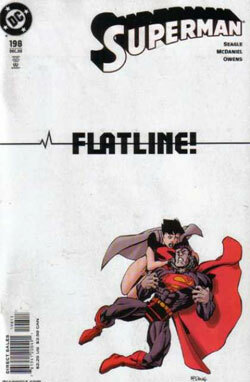 Kelex finds that Superman has a debilitating Kryptonian illness that is killing him, Xarxas. Noticing that Krypto has not come down with anything, nor has Cir-El, Kelex takes Cir-El to a scanner and learns that she is barely Kryptonian at all, and both of her parents were human. On the news, people recount how Superman phased through the plane he was rescuing last issue. In other news, Bizarro has gone crazy and is tearing apart downtown Metropolis. Bizarro lifts a tank above his head and spouts that he knows what he wants this time... to rule the world. He demands that Lex Luthor give him the world, now. The military calls Washington to tell them that there is a grave matter of Homeland Security.Bizarro is acting like he never has before. Kelex plops Superman in a bio remediation suit, which looks like a suit of armor based on the Millenium Giant Bull in the face, only in Superman colors. Kelex tells Superman about Cir-El, and the Bizarro Attack. Superman tells Cir-El he needs he help, and they take off to take care of Bizarro, who Superman assumes is now stronger and more intelligent, because the virus would work the opposite as it has on him for Bizarro. As they are leaving, Superman yells about how Cir-El broke a Phantom Zone crystal and something came out of the portal, but they are too far gone to notice. At the police precinct, Lois searches for Clark. Instead, she hears about Bizarro tearing up Lexcorp. Lex-Men attack Bizarro, as Talia Head looks on. Superman and Supergirl arrive, and Bizarro rips right into them. He takes Superman and smashes him on the ground, breaking his helmet off. Bizarro, it would seem, is talking normally, truly intent on taking the world for his own. He smashes Cir-El, because Cir-El tries to push him off of Superman, and Bizarro smashes her, telling her she can be his queen when he rules the world. Superman tells her to use leverage, and she does, sending Bizarro flying. She uses her red sun burst, hitting Superman AND Bizarro, sending both flying. Superman reiterates that Bizarro is getting stronger while he is getting weaker, and attacks him. The police helicopter, with Lois in tow, takes off with Talia to find out what Superman plans to do to handle Bizarro. Bizarro has realized that the probe will help him kill Superman and thus take over the world, so he crashes down near it. Cir-El and Superman arrive to stop him. Superman's suit is weakening. Superman attacks, and Bizarro smashes him. Bizarro punches Supergirl, and his hand breaks. Superman tells her that Bizarro's power is waning, and tells her to hit Bizarro, hard. She does. Bizarro is knocked out. Talia takes the probe despite Superman indicating that he needs it, because Homeland Security has decreed that the probe needs to be taken, and if he dares speak about it to anyone, he'll answer to a Homeland Security committee. They leave Bizarro. So Superman takes him, figuring Bizarro will help him get better. They make anti-bodies using Bizarro's blood, and Superman is cured. Supergirl suddenly collapses, and turns into a young girl who wears glasses. In Metropolis, the creature unleashed by Cir-El, looking very much like the bio regeneration suit, save with a silver face, tears into Metropolis, where "Yes" advertisements proliferate. Story - 1: Okay... there's some good stuff here. Bizarro, not Twerp-O, the pet villain project of Steven Seagle, like we see in other books like Action Comics. There's Superman, actually acting like Superman. And there's a somewhat interesting premise. But like a movie, you can know the whole plot, and it can sound great, but the execution... the execution. For instance, if you'd tell me I was about to read a comic about Superman fighting for his life in the Fortress of Solitude and then having a one-on-one brawl with Bizarro, I'd be jazzed up. And truthfully, when I heard that this was what was coming down the pike, I was excited. A weird, crazy premise. If Superman is weakened by a Kryptonian virus, then Bizarro, he's made stronger. I guess Steven didn't really read the resolution to "Emperor Joker", or maybe he just chose to ignore it, but Bizarro is a magical manifestation of Mxyzptlk's interpretation of an opposite of Superman, based in the Bizarro Luthor created and Joker brought to life through "Emperor Joker". He isn't Kryptonian. In fact, even if this Bizarro is a copy of the one we know from Pre-Crisis, I would postulate that he is ANTI-Kryptonian. Thusly, in my opinion, the virus would not harm or help him. BUT, if it did, it would not make him smarter. Otherwise, Superman would be dumber. BUT, if it did, it would not make him more ambitious. Certainly, Superman is not LESS ambitious in this issue. So it's just a comic book, yeah, but this stuff nags at you if you pay attention. And a good fight is essential to, well, a good fight. Throughout I could not pay attention, thanks to wondering how in the heck if Superman was dead a containment suit can make him any more capable to fight Bizarro than say, a tank battalion, or why he would even try without calling in the JLA. Big mistake, and Superman's not a rookie. He knows better. Cir-El might fly in stupid, but Big Blue doesn't. Bad writing. And hey, the containment suit is cracked open, fizzling out of control, but Superman's still not deaf, dying, phasing, passed out, or even more than simply winded? Granted, it is assumed that his condition is fluctuating. But it was fluctuating a lot faster than this last issue, and at very least we can note that this is inconsistent. And that said, the good fight essential to, well, a good fight simply isn't there. Note my descriptions. Superman hits Bizarro. Bizarro hits Cir-El. Cir-El hits Bizarro. It just isn't creative. What about slapping Superman upside the head with a Billboard while punting Cir-El to Utah? At least that would have been funny. This is just repetitive. And look... Bizarro wants Cir-El to be his bride, and for some reason has become megalomaniac Bizarro, just like the Mxyzptlk twins and any other remaining wholesome Superman fare left. I thought Bizarro loved Lois. No, now he's into Cir-El, and bent on dominating the world, just because making a lovable someone homicidal is so wholesome and cool. All I have to say to that is, WAY TO GO, GUYS! All we need now is for Bibbo to become a bad guy, and all we have is a blabbing angry Perry, a total Witch Lois, and whiny Jimmy for supporting characters. Way to go. And don't forget old divorcing Lana, never mind little Clark. Maybe I'm a purist. But purists are the folk who've been reading since time out of mind, so maybe they should be listened to. I'm not afraid of change. As unconventional as it seems, I loved the killing of Superman, the changing of Superman's hair, the Imperiex War, I love all these risks, when done right. The villain changes are being done for no reason other than to get people talking or to make a corny villain easier to write. And that indicates to me a lazy writer. I wrote a Mxyzptlk comic. He's hard to write. He's very cornball, he speaks in an odd tongue, and you'd think, given power like that, he'd just whomp Superman like Bizarro does this issue. But he doesn't. It's not in his nature. So I wrote around it, and surprised myself with the wellsprings you can come up with. I wish these writers would do the same with time-tested characters. He's dead, then he's fighting again, then he's magically healed. That destroys all of the tension of the piece, right there. And I swear to Metron and Sonny Grayven, if that Cir-El whines in my comic book one more time, ONE MORE TIME, she's gonna need more than a bio-regeneration suit (whatever the heck THAT is, why not use the Kryptonian matrix battlesuit?) to pull my foot from her crying behind. That's right. I'm threatening a fictional character. Things get really repetitive. You'll notice Superman tells Cir-El TWICE that he thinks his powers are going down while Bizarro's are going up. Why? I say sloppy editing. But that's just me. Maybe. And look. A bio-regeneration suit with malicious intent is in Metropolis. Bizarro, with a few punches, took Superman's bio-regeneration suit out. So we're supposed to feel tension that one is flying around Metropolis with the shady, hardly alluded to "YES" drink? I don't get it. This is just dumb. I mean, where's the grandeur here? The sense of wonder? What in the name of monkeys is Cir-El doing in a comic which deserves a fine place in American literature and with children of all ages? This needs to get more accessible, and not in a dumbed down way, in a more well written way. Shining characters. Reasonable action. Responsible people. And REAL tension. I wanted Steven to be a great shining light in a pack of bad books. And to be honest, he's absolutely WHOMPING Casey, but that ain't saying much. And look, folks. I know a lot of you like Ghetto Kelex. At times, I do as well. But five to ten pages (I don't know, because if you'll look, they killed page numbers as well as the letter column) of Kelex babbling about Superman, yo, it ain't really much more than a Sambo routine. Hate to put it that bluntly, but it is. Someone said: "Let's make entertaining a quality people associate with black people, and then exploit it, because it's 'hip'", whatever that means. Well, that's just so original. And one more thing, small in comparison to the whole, but large nonetheless. Kelex tries to warn them about the Phantom Zone thing, and they don't hear him. Two people with super-hearing. And hey, let's just give Cir-El a secret identity, just for the heck of it, out of nowhere. And Multiple Personality Disorder. Hey... this SHOULD be after the Supergirls story, right, because Lois is mentioned as being a TV reporter. So why is Supergirl seemingly new to Kelex and the Fortress. It starts with bad and ends in editing. It's been said before, but why another Supergirl? It makes the non-use of the pet project villain kind of negated, because it's a pet project Superhero, now, isn't it? Who do we have to blame for Bizarro's rampage? Superman, who didn't imprison Bizarro last time they met. Why? Because he just flies off now instead of putting people in the pen, thanks to the editor and the writers. Funny how this isn't explored. It might point something out that's obvious to everyone except the most casual reader and the editorial staff. I can only offer two compliments. Thank you for using Bizarro, as I said, and not Lame-O, the intergalactic bug that Superman doesn't want to fight, and thank you for making a political statement about the secrecy of the Department of Homeland Security and what it might do with regards to our health, our safety, and the state of what we hold dear, out metaphorical Supermans. But all in all, such horrible inconsistencies that it's hard to get lost in the story, which I blame half on Eddie Berganza for his title (editor) and half on Seagle for his (writer). Art - 4: This art is actually pretty good. Aside from the fact that Supergirl is unattractive (and I mean, take it to brass tacks, Supergirl should be hot), the narrative is smoothly told, and we know who is who, and things are very dynamic. Bad execution of words aside, I do like McDaniel. Now, the new Lex-Men, they just stink. I can't stand them. They're purple, which is one half of purple and green, which everyone knows is fan gold, but they're still dumb looking. The other design was much better. This leads up, perhaps, in theme, to the Superman/Batman Luthor suit (see the preview for 6 to see what I mean), which rocks the house, but outside of context, they're just lousy, so minus one. Cover Art - 1: Okay. I've done it in French. I've done it in minimalist fashion. I've done it calm, hostile, bitter, sweet, and now, I'm gonna do it in Pig Latin. Atline-Flay. At-what a ame-lay ord-way (heh, ord-way) to ut-pay on a over-cay. Uperman-Say ooks-lay ike-lay e's-hay ooping-pay. And I on't-day eed-nay to ee-say at-they. Ite-whey over-cays ain-stay. E-way an-fays ate-hay at-they. E-way eally-ray ate-hay at-they. Uperman-Say's olors-cay are off, as are ir-El-Cays. I oo-day ave-hay to ay-say at-they the ogo-lay is ixed-fay. Us-thay the wo-tay. Other an-thay at-they, is-they over-cay inks-stay. Ike-lay oop-pay. If only I ould-cay eak-spay is-they in Erganza-bayese, so e-hay ight-may ear-hay the ans-fay.